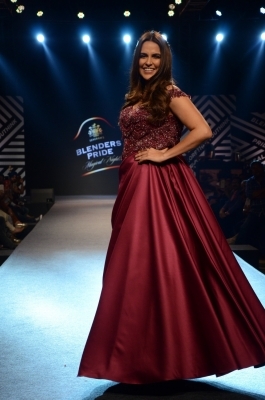 New Delhi April 14 (IANS) Actress Neha Dhupia who was seen flaunting her chic and glamourous avatars in films like "Tumhari Sulu" and "Qarib Qarib Singlle" says her fashion sense has evolved over the years and she now understands what works best for her. "For me fashion is about embracing yourself the way you are and ultimately being completely comfortable in your own skin. Over the years my fashion choices have evolved and I like to experiment with different styles be it glamourous or edgy. I have now found what works best for me and I associate with lovely designers to bring that vision to life " Neha told IANS . "Sonaakshi Raaj is one such designer that brings out the glamourous side in me yet keeping it effortlessly chic at the same time. I believe her designs represent the best of both my sides; bold and feminine " said Neha. "This particular collection is very close to my heart as it is all about celebrating woman and I could not think of a better person than Neha Dhupia to walk the ramp for me. Her style is effortless chic and completely relatable which perfectly embodies the Sonaakshi Raaj woman " said the designer.